3 Bedroom House For Sale in Exeter for £289,950. Imposing detached 1930's property located in a small cul-de-sac within level walking distance of St. Thomas amenities and Exeter's historic Quayside. This three double bedroomed property has been sympathetically renovated to a high standard throughout including new boiler, plumbing, electrics and carpeting yet retaining the period features of the 1930's era. The property also has a large driveway with parking for approximately 5/6 vehicles, detached garage and a large enclosed Southerly rear garden. No onward chain. A most impressive entrance to the property, typical of its period having access to all the principal ground floor rooms and stairs rising to the first floor. Feature contemporary fireplace. Original cornice to ceiling. Picture rail. Wall mounted lighting. Central ceiling light point. The floor has been sanded and treated to give an en vogue feeling throughout the whole of the ground floor level. This compliments the original doors which have been professionally stripped and stained to give a quality finish and to retain the period feel. Low level W.C. Wash hand basin. Obscure glazed window to side aspect. Tiled flooring. 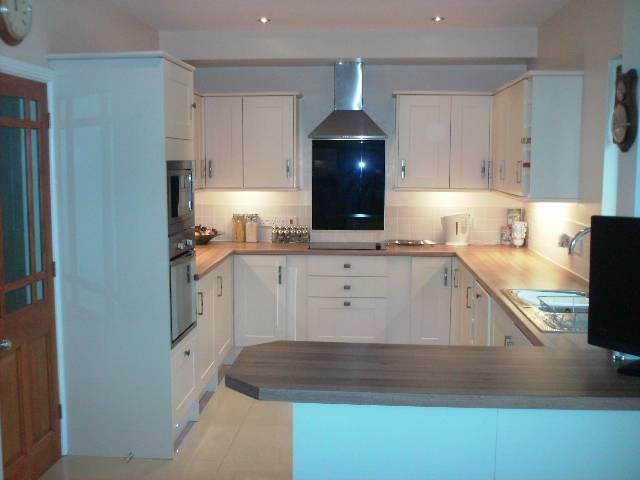 Newly fitted kitchen and appliances comprising Stainless steel one and a half bowl sink and drainer with mixer tap over built into newly fitted roll edged work top surfaces with matching cupboards and drawers under. Further range of matching wall mounted units. Recess ceiling spotlighting. Under cabinet lighting. Inset LED lighting at floor level skirting. Porcelain tiled flooring. Stainless steel extractor hood and ceramic hob with glass splashback. Integrated appliances to include separate fridge and separate freezer, dishwasher, washing machine and microwave. Display shelving. Complementary tiling to walls. Window overlooking the rear garden. Breakfast bar. Radiator. Recess ceiling spotlighting. Recess storage cupboards. Double French doors leading to the new large decking area with a sunny southerly aspect. Window to side aspect. Smoke detector. Hatch to large loft offering huge potential for creating additional living accommodation subject to the necessary consents. Picture rail. Built-in wardrobes. Window to front aspect. New contemporary suite including large double glass encased shower unit. Low level W.C. Pedestal wash hand basin. Modern chrome radiator/towel rail. Ceiling spotlighting. Victorian style oversized free standing roll top bath complete with shower attachment. Pedestal wash hand basin. Low level W.C. Recess spotlighting. Tiled flooring. Large chrome radiator/towel rail. Obscure glazed windows to front and side. Built in wardrobes. Picture rail. Radiator. Window to rear. Another double bedroom complete with built-in wardrobes. Radiator. Picture rail. Window to rear aspect. To the front of the property is a large driveway with parking for 5 or 6 vehicles and could easily accommodate a motorhome, caravan, boat etc. A high level double timber gates lead to the rear of the property giving access to the garage. The rear garden is newly lawned and enclosed by high level wall and timber fencing. There is a large decking area and shrubs and hedges to the boundaries. The garage is complete with electrics and suitable for a number of uses. It is currently being used as a gym.